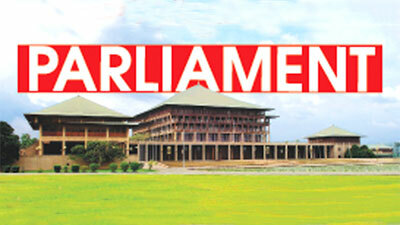 Parliament to take up a special debate on Provincial Council Elections on August 24 from 11am to 6.30pm, which had been agreed to at a Party Leaders’ Meeting chaired by Speaker Karu Jayasuriya in Parliament yesterday. The report of the Delimitation Committee on Provincial Councils, would be put before the House for a vote following the debate. The report had to be passed by a two thirds majority. Parliamentary sources said that the party leaders had proposed to revert to the old electoral system if the report did not receive a two thirds support. However, the sources further pointed out that the two thirds majority was needed even if the House wishes to repeal the new electoral system in order to go back to the previous system. The Delimitation Committee comprised Kanagaratnam Thavalingam (Chairman), retired Surveyor General Dr. Anila Dias Bandaranaike, retired Assistant Governor of the Central Bank, Professor S. H. Hisbullah, Prof. Sangara Wijeyasandiran and retired Assistant Elections Commissioner Premathilaka Siriwardena presented the report to the Minister on February 19. The Delimitation Report was submitted to the House by Provincial Councils and Local Government Minister Faiszer Musthapha on March 6. Elections for the Eastern, North Central and Sabaragamuwa PCs are already due and the term of another three PCs namely the Central, Northern and North Western PC is due to end by September. Party Leaders on July 20, agreed to schedule PC Elections on January 5, 2019 if Parliament could arrive at an agreement on matters relating to elections before the end of October. Qatar Ambassador A.S.P. Liyanage was hauled over the coal yesterday in Parliament for his involvement in the matter in relation to Stafford Sri Lanka School in Doha. UNP MP Ashoka Priyantha moved the adjournment debate on the matter where both MPs from government and the Opposition demanded quick action against the Ambassador. Foreign Affairs Deputy Minister in a statement stated that the Foreign Ministry awaits further directives from President Maithripala Sirisena to solve the issue with regards to Sri Lankan Ambassodor in Qatar A.S.P. Liyanage obstructing the work in Stafford Sri Lanka school in Doha. The statement was read out to the House by the Leader of the House Minister Lakshman Kiriella. “During the Cabinet meeting held on August 7, 2018 State Foreign Affairs Minister Wasantha Senanayake, in his capacity as the acting Foreign Employment Minister Harin Fernando requested from the President for another meeting with the relevant parties to settle the issue for good. We await another meeting scheduled to be given by the President in due course,” the statement said. According to the statement, a meeting was held on May 28, 2018 which was convened by Foreign Affairs Deputy Minister, headed by President Sirisena along with the attendance of the Ambassador Liyanage, Chairman of the School, the Board of Directors and the Trustees. The statement further said that at this meeting, President has instructed that no action should be taken until further directives are issued to resolve the issue. “However, it appears that further directives were not issued to the Foreign Ministry up to date.” it also said. Minister Kiriella after reading out the statement made his observations on the matter in concern. “I hope that all parties involved in the matter will put their heads together and find a solution to this problem.” he said. Further speaking, Minister Kiriella said the school in concern is a blessing for Sri Lankans who are employed in Qatar, and said that it has helped to keep around 1000 families together, who otherwise would have been living in separate countries. “The President should intervene in the matter and save this school. Even the Qatar government was very impressed by this school that they donated two acres of land to expand the school premises. That is the esteem with which this school is held.” Minister Kiriella added. JVP MP Sunil Handunnetti, joining the adjournment motion, pointed out that Sri Lankan government and Foreign Ministry should swiftly act to secure the school. It is not just saving a school, but it is a matter of securing the honour of our country, he pointed out. MP Handunnetti alleged that Foreign Minister and Deputy Foreign Minister are evading the matter and expressed his disappointment over the delay in solving the matter as well. He also said that it is the responsibility of the Foreign Ministry to officially inform about this issue to Qatar government. Handunnetti demanded the Foreign Ministry and the government to make an official statement expressing the stance they take on this matter. “If there were misdeeds in that school, there are so many ways to figure them out and take actions against. Why this ambassador poked his finger into that? He has no power to do so. This person has clearly violated his diplomatic powers so he should not be given the immunity further.” MP Handunnetti observed. The United National Party MP Ashoka Priyantha moving the adjournment motion regarding the matter said Ambassador Liyanage had intervened in the activities of the said school violating his powers. Therefore, the Foreign Affairs Ministry should take an immediate action against this Ambassador, Priyantha said.